And here is that page rendered in Internet Explorer 8. In one case it’s being served on my laptop, and the other on the local intranet. The markup, the Web servers, and the browser are all set up 100% the same. These should be identical, shouldn’t they? What’s the problem? The answer is Compatibility View. 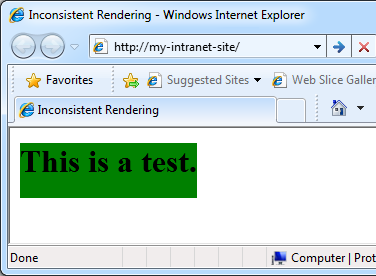 Compatibility View is a “feature” of Internet Explorer that causes it to ignore modern Web standards. That would be fine, except Compatibility View settings vary by zone, and different zones have different defaults. Also, the Compatibility View button in the address bar isn’t always available, which means there’s no visual indicator as to what mode you’re in, and you can’t change modes for the current page easily. Compatibility View settings can be accessed in the Tools –> Compatibility View Settings menu, but if you’ve developed a standards compliant intranet site, you need a better fix than simply asking each individual user to reconfigure their browser. Group Policy is one option, but there is a much simpler solution. Just add the following meta tag to your pages, and it will force IE 8 to use the !DOCTYPE declaration in the page to determine the rendering mode. 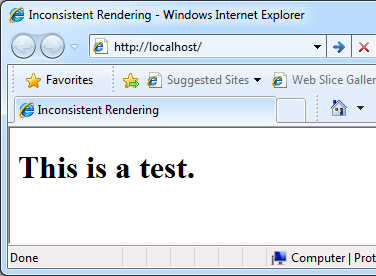 If you’re experiencing rendering inconsistencies with the same markup being served from different environments, have a look into Compatibility View. It just might be the culprit.